It is common knowledge in Vietnam that the Mekong Delta in Vietnam has two seasons, the “dry” one between December and April, and the “rainy” one between May and November. 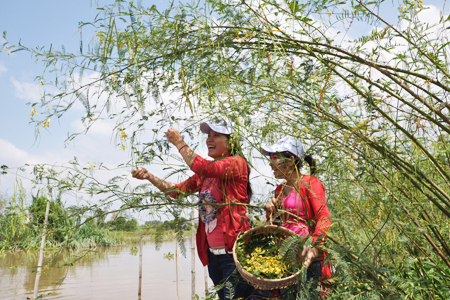 Tourists pick dien dien (Sesbania sesban) flowers in the Mekong Delta province of An Giang. The flower is one of the characteristics of the delta’s high-tide season that starts in the seventh month and ends in the tenth month of the lunar calendar.